Elizabeth Augusta Egerton was born in 1843 at Bunbury in Cheshire, the daughter of the Reverend John Egerton 1796-1876 and his wife née Ellen Gould 1802-1862. She was known as Augusta. On 5 August 1869 she was married to Robert Moss King at Swanley in Kent. He was born in 1832 at Long Crichel in Dorset, the son of the Reverend William Moss King and his wife nee Elizabeth Margaret Coddington. He was baptised on 29 November 1832 at Long Crichel by his father, the Rector of the parish. He was educated at Eton and Merton College, Oxford, graduating Bachelor of Arts in 1855. He joined the Bengal Civil Service, and arrived in India on 22 October 1856 (1). Elizabeth Augusta Moss King accompanied her husband to India, and on their second tour of duty she wrote diaries which were published in two volumes in 1884 entitled Diary of a Civilian's Wife in India 1877-1882 (2). 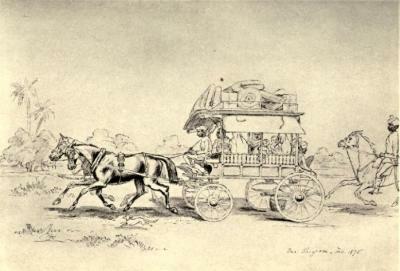 She illustrated both volumes with many drawings made by herself while travelling. Gerald Moss King. He was born in 1870 and died in 1871. Robert Curzon Henry Moss King. He was born in 1871 at Lucknow in India. In 1881 he was aged 9 years old living with his aunt Mrs Lucy Campbell at the Farrs in Wimborne Minster in Dorset, his parents being in India. He married Catherine Frances Kitson, and died on 14 September 1929 at Rochester in Kent. He joined the Indian Civil Service, and was appointed a Judge of the High Court of Allahabad in India on 15 October 1929. He retired to Harcourt House at Camberley in Surrey. Bertram Moss King. He was born in about 1872 and died in 1876. Geraldine Moss King. She was born in 1873 in India. In 1881 she too was living aged 8 years old with her aunt Mrs Lucy Campbell in Wimborne Minster. She died in 1888. Lucy Moss King. She was born in 1875 in India. In 1881 she too was living aged 6 years old with her aunt Mrs Lucy Campbell in Wimborne Minster. In 1903 she was married to Layard Livingstone Fenton of Marsh Hall, North Molton in Devon, a Lieutenant-Colonel in the Indian Army, born in 1855 in Bombay. She died at Marsh Hall on 22 February 1937. Margaret D'Este Moss King. She was born in 1876 at the Villa D'Este on the shore of Lake Como in Italy (4). In 1881 she also was living aged 4 years old with her aunt Mrs Lucy Campbell in Wimborne Minster. In 1911 she was living unmarried with her widowed mother at Ashcott Hill in Bridgwater. On 14 December 14 1925 she was married to her first cousin Charles Hertel Egerton 1884-1951 at the Garrison Chapel, Rangoon in Burma. She died in 1930 at Great Bedwyn in Wiltshire. Carleton Moss King. He was born on 17 July 1878 at Meerut in India, and educated at Balliol College, Oxford. He married Fanny Helen Cruikshank, and entered the India Civil Service. He was for many years Chief Judge of the Chief Court of Oudh in India, and was knighted. Sir Carleton Moss King died on 26 November 1954 at Fleet in Hampshire. Elizabeth Augusta Moss King and her husband retired to Ashcott Hill, Bridgwater in Somerset. When the 1911 Census was taken she was living there with her unmarried daughter Margaret, together with a parlourmaid and housemaid. The house had 22 rooms. She had been married 33 years and had seven children, of whom three had died by then and four were still living. Elizabeth Augusta Moss King died on 22 July 1917 at Ashcott Hill (5). Her husband Robert Moss King had predeceased her on 7 July 1903 at Ashcott Hill. The drawing is by Elizabeth Augusta Moss King, and is from Volume 1 of her book Diary of a Civilian's Wife in India 1877-1882 between pages 38 and 39. (2) The book gives little family information other than its dedication to her children and her sister, presumably Lucy Moss King who was caring for the older children and to whom she sent batches of pages as they were written. She refers only obliquely to the birth of her youngest child, her son Carleton, in Meerut on 17 July 1878, with little later information about him, The book is nevertheless a highly readable account of life in India at the time, particularly when there was great anxiety about the disastrous war being fought then in Afghanistan. Her descriptions of a lengthy tour taken with her husband and son to Kashmir are particularly finely written. (3) The order of their birth is given in the pedigree published in Descent and Alliances of Croslegh, or Crossle, or Crossley, of Scaitcliffe; and Coddington, of Oldbridge; and Evans, of Eyton Hall C. Croslegh (1904) page 292. (4) Formerly a palatial private residence, the Villa d'Este had recently been converted into a grand hotel. (5) National Probate Calendar (Index of Wills and Administrations) 1858-1966 (1917) page 450. Probate of her Will was granted at London on 29 October 1917 to her daughter Margaret D'Este King, spinster. Effects £8863 4s 1d.